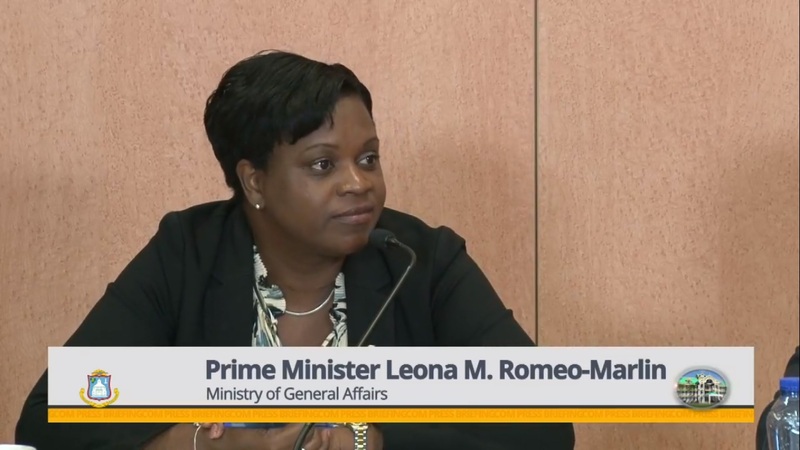 PHILIPSBURG—Prime Minister Leona Romeo-Marlin in her address to the people of St. Maarten on the vote of no-confidence against her government by the National Alliance faction in the Parliament said that she has the support of all the ministers of the Council of Ministers. The draft motion vote of no confidence was tabled by Member of Parliament William Marlin while the Prime Minister was at the Parliament to answer questions regarding the restructuring of the Princess Juliana International Airport. She read the entire draft motion of no confidence and noted that immediately after the hurricanes her government had soften the requirements for financial aid for more persons to receive the aid. She pointed out that there were more than 2000 families that received food vouchers with a cost of Naf1.5 million guilders. She spoke of the training that was introduced for persons working in the hospitality sector while receiving a stipend and was later expanded to other fields such as construction. She further mentioned that the participants also received health insurance which was seen as requirement for the persons who were engaged in the training. It was also explained that the Department of Social Services are also facilitating persons to acquire a high school diplomas which will enhance them in the job market. The government in their program also assisted the persons in need with gift baskets and further assisted home owners with building material. The government will soon launch another initiative to hand out building materials vouchers. The government is also busy with persons who were listed for roof repairs have the necessary documents to facilitate the process. With regard to the reconstruction of the Princess Juliana International Airport she noted that airport management that carries the primary responsibility for the financial aspects of the airport was “not able to secure the necessary financing on the private market,” she said. However, the government was able to get financing at an attractive rate at the World Bank and the European Investment Bank. She noted that the management of the airport accepted this “as a last resort” since they had no viable alternatives for financing. “I have fulfilled my obligations to Parliament by attending all meetings when called upon and give all information when requested,” she confirmed. The reconstruction of the airport, she said has been a top priority since she took office and indicated that the recovery strategy focuses on repairing and rebuilding the airport and related facilities to a much higher standard, said the Prime Minister to ensure resilience in the face of a disaster. The $100 million speaks volumes of the efforts to secure the reconstruction of the gateway to St. Maarten economy. Since taking office she has worked with all members of Parliament and in the entire Kingdom to ensure that the island retains the confidence of all.